TAKE ON BIG JOBS. The 2018 NV Cargo High Roof and NV Cargo Standard Roof ensure you'll have two great ways to handle it. These are the kinds of vehicles you need to do business today: smarter, tougher, and more comfortable with advanced and convenient technology. Try one or both of them -- we think you'll find they're the perfect tool to TAKE ON TODAY. 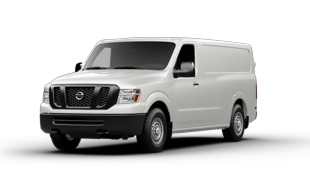 The 2018 Nissan NV Cargo van provides exceptional utility thanks to a long, wide cargo floor, square-top wheelwell housings and nearly vertical sidewalls -- room to fit two 40x48-inch pallets, 10-foot piping or 4x8-foot drywall sheets. Along with maximizing cargo space, the sidewalls accommodate aftermarket storage systems without excessive modification. 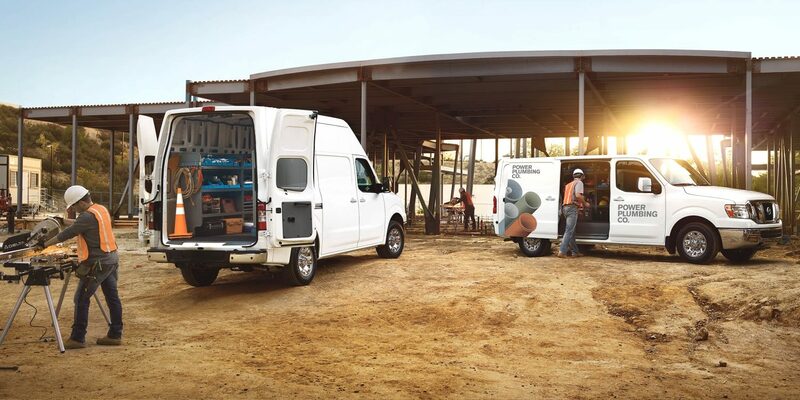 The Nissan NV Cargo provides rugged body-on-frame construction across the entire lineup, including with a High Roof -- the only van in the segment1 to offer this, providing most users the ability to walk, stand and work in the cargo area. For the 2018 model year, all NV Cargo grades come equipped with standard RearView Monitor, 5.0-inch color display audio (5.8-inch standard on SL grade), Bluetooth® Hands-free Phone System, Streaming Audio via Bluetooth, Hands-free Text Messaging Assistant and USB connection port for iPod interface and other compatible devices. In addition, the previous Power Package option content -- power windows with driver's side one-touch down, power door locks with central locking, auto door lock function, Remote Keyless Entry and cruise control with steering wheel controls -- is now standard on S grade. As in previous years, the 2018 NV Cargo van provides exceptional utility thanks to a long, wide cargo floor, square-top wheelwell housings and nearly vertical sidewalls -- room enough to fit two 40x48-inch pallets, 10-foot piping or 4x8-foot drywall sheets. Along with maximizing cargo space, the sidewalls accommodate aftermarket storage systems without excessive modification. The NV Cargo's rugged design combines a full-length hood with access to the engine for service and maintenance, along with signature Nissan styling cues such as large headlights and vertical grille. The broad body sides project a serious commercial vehicle appearance and provide ample room for company logos and advertising messages. The tall, wide doors offer easy access to the cargo area. BILLBOARD ON WHEELS: Give your van a personal touch and get noticed with attention-grabbing graphics that help your NV - and your business - stand out. Inspired by customer needs and usage, the Nissan NV Cargo offers an array of smart functionality features, including storage pockets, spaces and compartments designed to provide secure access to the typical commercial customers' everyday use objects. High Roof models offer an available overhead console designed to hold work gloves, legal size binders, safety glasses and system books. The available lockable center console (removable) fits hanging files and laptop computers and includes a computer or mobile phone charging point, as well as a lid that slides forward to provide a more usable work surface. The available storage drawer under the driver's seat is ideal for storing paperwork, tools or other items that require quick access. 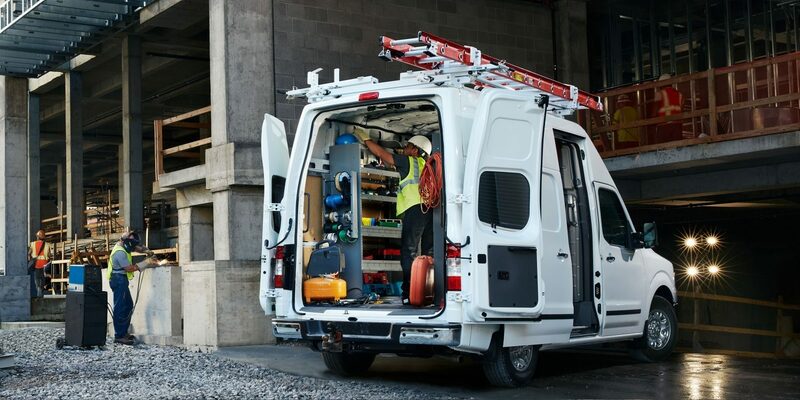 Since commercial vans must serve many functions -- including acting as an office on the road or at a job site -- storage and productivity items are integral to the design, rather than tacked-on afterthoughts. The result is a clean, practical and comfortable workspace for a wide variety of professions and businesses. 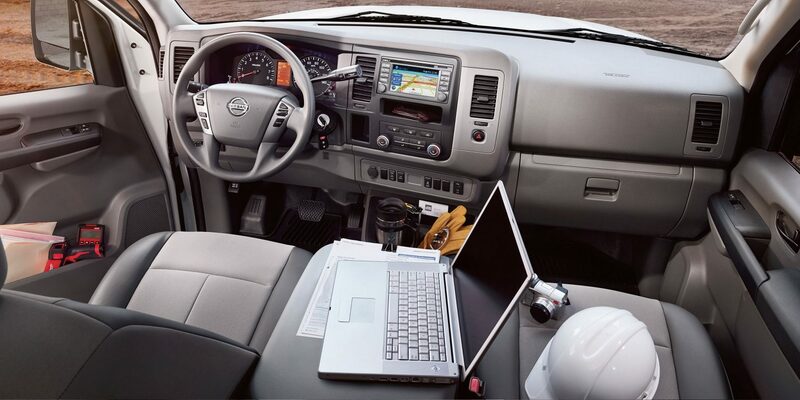 Along with being conceived as a ''mobile office,'' the Nissan NV Cargo is designed to function as a ''mobile workshop'' with exceptional utility -- thanks to its wide door openings and simple, flexible cargo area layout with a long, wide cargo floor, square-top wheel well housings and nearly vertical sidewalls. The NV Cargo offers room between the wheelhouses to accommodate standard plywood or drywall sheets or pallets. A range of cargo area tie-down rings, along with ample cargo area lighting, further enhances the NV Cargo's utility. Along with maximizing cargo space, the NV Cargo is designed to accommodate aftermarket customization and modifications with 57 interior reinforced integrated attachment points for installation of cargo customization equipment -- requiring no sheet metal drilling. The nearly vertical sidewalls accommodate aftermarket storage systems without excessive modification. The cargo area also features a full-length inner panel to prevent cargo from denting the vehicle's outer skin (SV models). The roof attachment points are designed to accommodate installation of various ladder or utility rack systems without piercing holes in the roof, which can lead to corrosion and water leaks. The cargo area also features standard ''upfitter pre-wiring'' for easy access into the electrical system, wide-coverage cargo area lighting and available power outlets including available 3-prong 120V outlet in center console and D-pillar locations. The advanced 5.6-liter Endurance® V8 gasoline engine features best-in-class3 horsepower and torque of 375 hp and 387 lb-ft of torque. Assembled in Decherd, Tenn., it is matched with a heavy-duty 7-speed automatic transmission. The Endurance® V8 engine features four-valves per cylinder, Variable Valve Event and Lift, and Direct Injection. Throttle response is enhanced by directly controlling the intake valve, rather than using the traditional method of controlling intake with a throttle valve, and valve timing and opening with non-variable camshafts. The Endurance® V8 engine also features Direct Injection Gas (DIG) technology, which provides better wide-open throttle performance and improved fuel economy and emissions performance (versus a non-direct-injection system) by reducing engine knock, improving combustion stability and offering precise injection control. An 11.2:1 compression ratio aids overall engine efficiency and performance and a Multi Control Valve (MCV) assists in managing the engine's thermal efficiency better than a traditional thermostat. 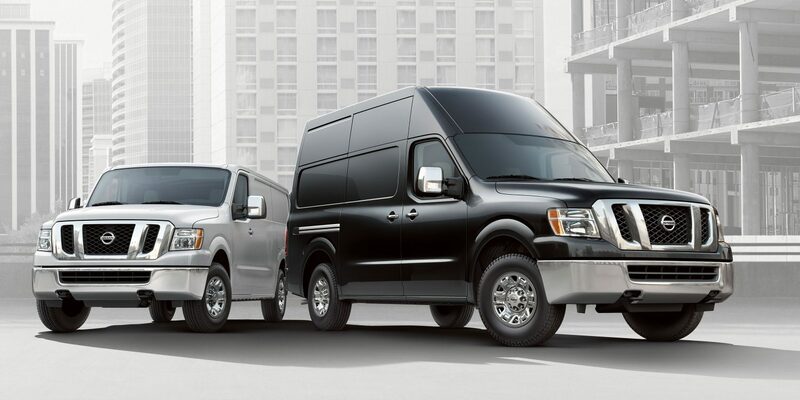 The engine is also utilized in the NV Passenger van, TITAN half-ton, TITAN XD and Armada models. 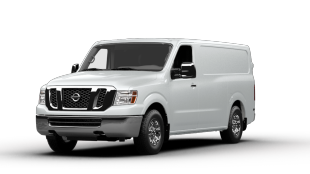 NV Cargo models equipped with the Endurance® V8 engine are outfitted with a 7-speed automatic, which features Adaptive Shift Control and Downshift Rev Matching. Other standard NV Cargo equipment includes heavy-duty 4-wheel disc brakes with 14.1-inch front/14.3-inch rear rotors and 4-wheel Anti-lock Braking System (ABS), engine-speed-sensitive hydraulic re-circulating ball steering system, independent front suspension with stabilizer bar, solid rear axle with leaf springs and stabilizer bar, 17-inch steel wheels and LT245/70R17 all-season tires (LT245/75R17 for 3500-series vans). Safety systems include dual-stage supplemental front air bags, supplemental front seat-mounted side-impact air bags, roof-mounted curtain side-impact air bags with rollover sensor for front outboard occupant head protection and 3-point front seat belts with pretensioners and load limiters. Also standard is a Tire Pressure Monitoring System (TPMS) and Vehicle Dynamic Control (VDC). One of the overarching goals for the NV Cargo design was to combine pickup truck-like comfort, interior amenities and drivability with a cargo van's capacity and security. 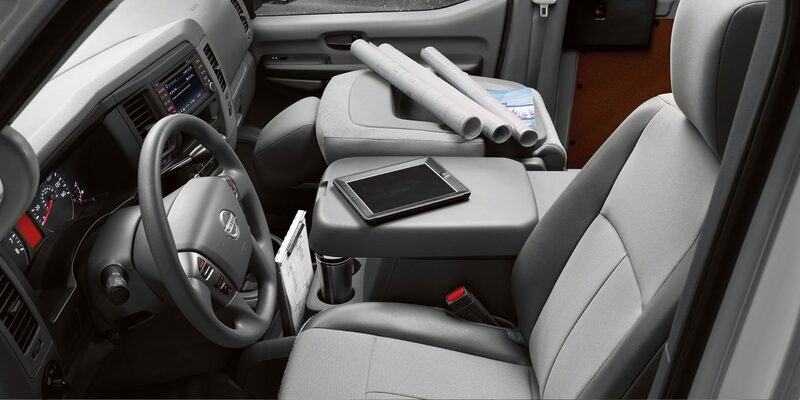 The Nissan NV Cargo interior answers one of the major unmet operator needs -- driver comfort and roominess. The wide front doors provide easy ingress and egress, while supportive bucket seating with extensive adjustability, large armrests and a truck-like driving position with ample legroom and foot room enhance comfort. The available center console (removable) provides a range of integrated storage features, while the fold-down passenger seat adds worktable functionality and enhances the cab's feeling of openness. Another major contributor to the pickup-like cab is the absence of the traditional van engine ''doghouse'' that intrudes into the cab due to the setback engine placement. The Nissan NV Cargo utilizes a conventional truck engine layout with out-front engine design. This not only frees up space under the instrument panel and between the seats, it also provides easy under-hood access to the entire engine for routine service and maintenance. The NV Cargo's ample cargo area offers a 120.0-inch cargo floor length and 70.2-inch maximum cargo floor width. NV Cargo Standard Roof models offer a maximum 55.8 cargo area height, among the tallest in class. The NV Cargo High Roof provides a maximum 76.9-inch cargo room height -- enough for most users to move about the cargo area while standing up straight. The NV Cargo is the only available High Roof model in segment1 with rugged body-on-frame construction. Standard Roof NV Cargo models are designed to fit in most garages or go through most car washes and fast food drive-through lanes, along with offering easier reach to access roof racks. Many businesses, however, require the added cargo capacity and the ability to stand up and work inside -- which the High Roof NV Cargo delivers, enhancing everyday operations and productivity. 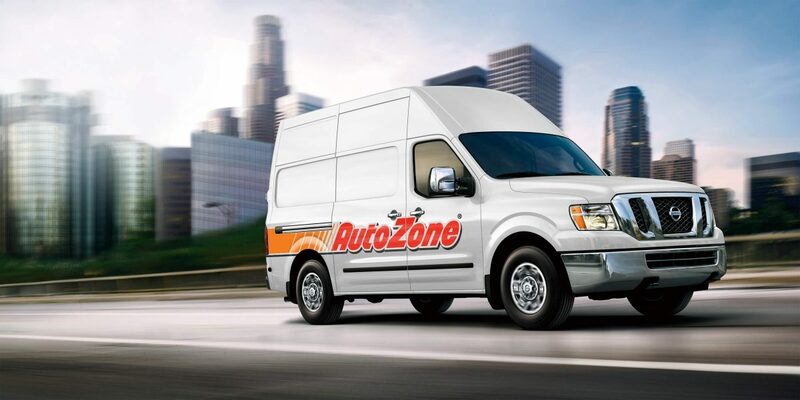 Since commercial vans must serve many functions – including acting as an office on the road or at a job site – storage and productivity items are integral to the design, rather than tacked-on afterthoughts. The result is a clean, practical and comfortable workspace for a wide variety of professions and businesses. Along with being conceived as a ''mobile office,'' the Nissan NV Cargo is designed to function as a ''mobile workshop'' with exceptional utility – thanks to its wide door openings and simple, flexible cargo area layout with a long, wide cargo floor, square-top wheel well housings and nearly vertical sidewalls. The NV Cargo offers room between the wheelhouses to accommodate standard plywood or drywall sheets or pallets. A range of cargo area tie-down rings, along with ample cargo area lighting, further enhances the NV Cargo's utility. Along with maximizing cargo space, the NV Cargo is designed to accommodate aftermarket customization and modifications with 57 interior reinforced integrated attachment points for installation of cargo customization equipment – requiring no sheet metal drilling. The nearly vertical sidewalls accommodate aftermarket storage systems without excessive modification. Dealer sets actual price. Prices and specifications are subject to change without notice. Excludes tax, title, license, and destination charges. I wanted to KoooDooo Share this cool website link with you. Let me know what you think: http://roundrocknissancommercialvehicles.com/new.vehicles.php?mdl=nissnv252018.